The Cenozoic deformation in the Salar de Antofalla area is summarized in Fig. 16. Four main stages can be distinguished in general terms and will be discussed below. During the Late Eocene (~ 38 Ma, e.g. Döbel et al. 1992) strong contractional to transpressional deformation took place in the Late Cretaceous - Paleogene magmatic arc, the present Chilean Precordillera. The „Incaic phase" (Steinmann 1929) triggered east and west-vergent thrusting and reverse faulting of basement blocks onto folded Late Eocene strata. Contraction was accompanied by dextral, arc-parallel strike-slip movements. At the western border of the Precordillera, shortening reached a maximum amount of 32 %, becoming less important in the central zone (max. 18 %) (Günther et al. 1998). In the study area, tectonic structures coeval with the Incaic shortening are absent. However, Tertiary sedimentation began simultaneously with tectonism in the Chilean Precordillera. Therefore, we presume that deformation, uplift, and erosion of the Incaic mountain range triggered the sedimentation of the Late Eocene to Late Oligocene Quiñoas Formation. The first deformation involves E-W to WNW-ESE shortening accommodated by a significant west-vergent reverse fault system. The related structures can be observed along the entire western margin of the present Salar de Antofalla where crystalline basement rocks were synsedimentarily reverse faulted and thrusted onto tilted Eocene/Oligocene sediments (Fig. 8). Thick-skinned compressive deformation was accompanied by the onset of coarse-grained alluvial fan sedimentation of the Chacras Formation. Directly at the fault contact, west of the thrust front, the conglomeratic part of the succession reaches its highest thickness and highest clast sizes. Transport direction (Fig. 7) as well as clast composition and facies distribution (Adelmann in prep., Voss in prep.) indicate that in the entire area of the present Salar de Antofalla a highland mostly composed of crystalline basement rocks was uplifted. Deformation D1 is marked also by a widespread angular unconformity (max. 30°) between the Quiñoas and the Chacras Formations. Directly beneath the unconformity, a tuff layer yielded an age of 28.9 ± 0.8 Ma (ID-51). The oldest sediments of the overlying Chacras Formation have been dated with 24.2 ± 0.9 Ma (ID-86) and 22.5 ± 0.6 Ma (ID-18). Therefore, we presume that deformation D1 occurred between 28 and 25 Ma. During the Early Miocene, renewed E-W to WNW-ESE shortening (D2) reactivated the west-vergent fault system that was active during deformation interval D1. Additionally, D2 produced new reverse faults and thrusts where basement blocks were thrusted towards both east and west onto tilted Tertiary strata. Based on the following structures, we suggest that deformation D2 took place between 20 and 17 Ma. (1) At the western border of the present Salar de Antofalla, a west-vergent reverse fault system is exposed. We presume a reactivation of the fault system mentioned above (D1 deformation). Associated structures are best displayed east of Volcán Antofalla. There, crystalline basement rocks were reverse faulted onto fan sediments (18.5 ± 0.5 Ma [ID-40]) showing progressive angular unconformities (Fig. 9). Based on these observations, deformation and alluvial fan sedimentation are thought to have occurred coevally. (2) At the eastern margin of the Sierra de la Quebrada Honda, the east-vergent thrusting of Early Paleozoic metasediments onto deposits of the Potrero Grande Formation (17.39 ± 0.08 Ma [ID-8]) is exposed (Voss in prep.). The latter were presumably syntectonically shed from the Sierra de la Quebrada Honda area indicated by transport direction (Fig. 7) and clast composition. (3) The distinct angular unconformity between the Chacras and Potrero Grande Formations constrains the time of deformation. In the area of the Salina del Fraile, deformation started after 22.5 ± 0.6 Ma (ID-18, Chacras Formation) and terminated before 17.1 ± 0.3 Ma (ID-97, Potrero Grande Formation). In contrast to the Late Oligocene/Early Miocene deformations D1 and D2, which affected the western and central part of the Salar de Antofalla area, the Mid-Miocene E-W to WNW-ESE shortening (D3) is confined to the eastern part only (Fig. 2). In the western part, no significant structural elements indicating compression younger than Early Miocene can be found. Between the Salar de Antofalla and the Sierra de Calalaste (Fig. 2), tectonic activity produced a series of west-vergent reverse faults and thrusts trending parallel to the present Salar de Antofalla (Adelmann 1997, Voss in prep.). Early Paleozoic and Permian strata as well as older Tertiary sediments were affected. Uplift formed a new highland from which coarse-grained sediments (lower part of the Juncalito Formation) were syntectonically shed into the basin (Fig. 7). 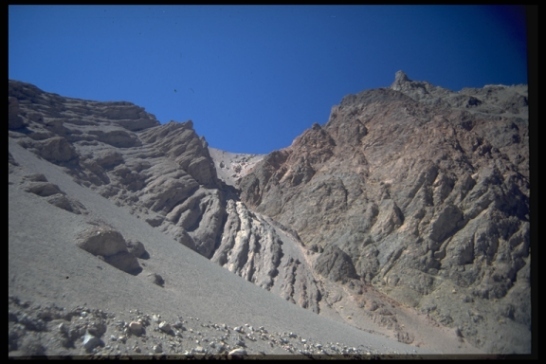 The onset of alluvial fan sedimentation is documented by an age of 11.2 ± 0.3 Ma (ID-48) suggesting that deformation D3 is roughly correlative with the „Quechua event" which is widely recognized in the Puna-Altiplano and the Eastern Cordillera (Coira et al. 1982). During the final deformation interval D4, further E-W to WNW-ESE contraction was accommodated. Structures indicating compressive deformation are apparent east of the present Salar de Antofalla where Middle Miocene to Pliocene sediments were deformed. The tectonic style can be described as thin-skinned tectonism as indicated by almost subhorizontal west-vergent thrusts and overturned folds within the playa deposits of the Juncalito Formation. Early Paleozoic, Permian, and older Tertiary strata of the adjacent Sierra de Calalaste (Fig. 2) were reverse faulted onto these sediments. Presumably, older reverse faults, that were active during the deformation interval D3, were reactivated. In the southern part, at the eastern border of the present Salar de Antofalla, the age of deformation D4 is indicated by undeformed ignimbrites (3.605 ± 0.005 Ma [ID-11]) unconformably overlying folded Juncalito sediments. Farther east, the same ignimbrite unit is intercalated in alluvial fan sediments of the Escondida Formation which were tilted synsedimentarily. Apparently, shortening can be correlated with the „Diaguita phase" described by Salfity et al. (1984). Contraction was followed by strike-slip movements visible at the NE-trending right-lateral Acazoque strike-slip fault (e.g. Segerstrom and Turner 1972, Marrett et al. 1994) crosscutting older D4 reverse faults and thrusts (Fig. 2). This significant structure exhibits right-lateral displacement and terminates in a „horsetail splay" or „extensional imbricate fan" respectively (sensu Christie-Blick and Biddle 1985, Woodcock and Fischer 1986) (Fig. 10). The Acazoque strike-slip fault system was active during Pliocene times. A basaltic andesite from the Acazoque valley (north of Cerro Beltrán) deformed by this fault system indicates that deformation is younger than 5.3 ± 0.3 Ma (ID-46). The change from contractional movements with WNW-ESE shortening to a strike-slip deformation with ENE-WSW shortening was also observed in surrounding parts of the Puna and the adjacent Eastern Cordillera by Marrett et al. (1994). They postulated the onset of the strike-slip movements at 2 Ma. Also, in the Salar de Incahuasi area, Late Pliocene sediments (1.7 ± 0.1 Ma [ID-73]) can be observed which were affected by strike-slip movements. There, a reactivation of N to NNE-trending faults with a lateral component is presumed. Additionally, at the southwestern border of the Salar de Antofalla, some slope-parallel normal faults occur (Fig. 2). They are interpreted as gravity slide effects due to the steep relief. Because of their limited distribution and displacement, they are not thought to be basin-forming. for citation use: Kraemer, B., Adelmann, D., Alten, M., Schnurr, W., Erpenstein, K., Kiefer, E., van den Bogaard, P. and Görler, K. (1999): Incorporation of the Paleogene foreland into the Argentina Puna plateau: The Salar de Antofalla area, Southern Central Andes - Journal of South American Earth Sciences 12/2.